Francesca Choy-Kee and Libby Woodbridge in Bossa Nova. 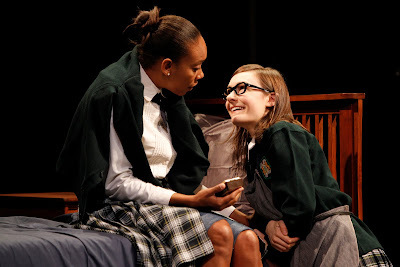 Photo © Joan Marcus, 2010.
and controlling mother Lady (Ella Joyce) comes to a head in this well- written study of broken dreams, forgiveness and standing up for what you believe is right. Memories of her experiences at a New England boarding school flood back when Lady announces that she's sending her other daughter, Jane (Malenky Welsh) to the mostly-white school where Dee never fit in. When: The run concludes Saturday, Dec. 18. Where: Yale Repertory Theatre (1120 Chapel St. at York Street). Who Will Enjoy this? : Anyone who has had a controlling parent, a failed relationship or who has struggled with taking a stand. Grace Mahoney as Dee's quirly artist roommate at the school is a hoot. She's funny and sad all at once. Michael Cabot gives an affecting performance as the jazz worshipping teacher with whom Dee becomes romantically involved. Lowlights: Part of the plot that is supposed to come as a surprise was telegraphed by a flubbed line the night I saw the show, though things seemed pretty obvious by that point any way. Tickets range from $10 to $85 and are available online at http://www.yalerep.org/, by phone at 203-432-1234, and in person at the Yale Rep Box Office, 1120 Chapel St. at York Street). Student, senior, and group rates are also available.